A relay center for the deaf in Holyoke, Massachusetts is closing. The state choose not to renew the contract of Communication Services for the Deaf. The Sioux Falls, South Dakota-based company owns nearly a dozen such centers around the country that lets people to communicate on the phone by typing text and having it read to another person. Another, unnamed company will take over in July. The move puts 62 people out of work. A bank in Austin is making video conferencing available, so deaf customers will have interpreters available to them. It’s only available at the downtown headquarters of Frost Bank in conjunction with San Antonio’s Deaf Link. The link is secure and encrypted. Senior vice president of consumer sales, Patti Bliss, is heading up the project. Her son is deaf. Amy Winehouse Dionne Warwick, and Rod Stewart are among the celebrities that have signed up to promote education about hearing loss. They’ve all been photographed cupping their ear for the Hear the World campaign. It was launched by Phonak Hearing Systems. AT&T plans to offer a new iPhone plan designed for the deaf and hard of hearing. The TAP (Text Accessibility Plan) will run $40 a month. It gets you unlimited data and visual voice mail along with unlimited text messaging. Voice calls will cost 40 cents a minute and a two-year contract is required. Customers who want the plan will have to fill out a forms that verify of a hearing impairment from a health care professional, a speech or language therapist or a nonprofit group working in the area of disabilities. 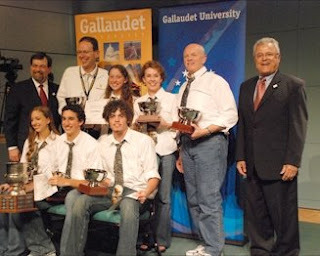 The Indiana School for the Deaf took top honors at the 11th annual National Academic Bowl at Gallaudet University in Washington, DC. The Maryland School for the Deaf came in second, followed by Edmonds-Woodway High School of Edmonds, Washington and White Station High School of Memphis, Tennessee. Allison Weiner of the Maryland School for the Deaf was given the award for Outstanding Player, while the Sportsmanship Team Award went to W.T.Woodson High School of Fairfax, Virginia. James Raymond has permanent hearing loss that he suffered during his time in Afghanistan. And now, the Army wants to send him to Iraq. Raymond was given an honorable discharge four years ago. Congressman Brian Higgins is asking the Defense Department to postpone Raymond's deployment so there can be a hearing on his ability to serve. He’s schedule to report to Fort Benning, Georgia next month. Nebraska is lowering it's charge to telephone users for communications services for the deaf to only four cents - the lowest since 1991. The surcharge falls a penny starting in July. The relay service for the state can be reached by dialing a toll-free three-digit number (711). The Rhode Island School for the Deaf is in tourmoil after three of the nine trustees recently resigned from the board of directors. The assistant director of administration and operations has also been fired. Board chairman Marc Gursky had a vote of confidence from the teachers’ union before he resigned. He offered no explanation as to why he choose to leave at this time. There is a division over teaching methods to be used with the more than 100 students. Nevada is about to get its first campus dedicated to teaching students who are deaf or hard-of-hearing. The Las Vegas Charter School of the Deaf has been six years in the making. It opens this fall with about 25 students. There are more than 400 students in the Clark County School District who are deaf or hard-of-hearing. They are mainstreamed with the help of interpreters and will slowly be moved into the new facility. It will focus on the bilingual-bicultural model, where teachers are ASL fluent but students learn to read and write in English. A search for teachers is underway who are fluent in English and sign language. A proposed Minnesota law would force candidates for state-level offices to include closed captioning on broadcast ads and Web sites promotions. The bill has already passed the state senate. But there are loopholes in the measure: Campaigns can opt out by submitting an explanation to state regulators explaining why they haven’t followed the news rules and they also can post transcripts for radio ads on their Web site. The law wouldn’t apply at all to campaigns that skip public financing. Marlee Matlin was voted off Dancing with the Stars tonight. She thanked the judges, her family and Henry Winkler for his support. She also thanked Fabian her partner "for giving me the most beautiful art of dance in my life." The deaf actress will appear on Jimmy Kimmel live later this evening. Japan’s first school dedicated to the use of sign language is now open in Tokyo and teaching about 40 students. It’s the effort of a nonprofit organization called Bilingual Bicultural Education Center for Deaf Children. Japanese sign language has long been unofficially used by deaf people in Japan to communicate because the focus has been oral education. Until last year, the education ministry had rejected requests to use of sign language and the BBEC had to ask for donations at fundraisers and over the Internet. The secret’s out... Deaf children can listen and talk. The school offers oral and auditory education. Those who are committed to Deaf Culture and American Sign Language see it as a insult, pushing kids away from the Deaf community. The school considers it a positive message. Marlee Matlin had the lowest marks of any celebrity on tonight’s Dancing with the Stars. All three judges gave the deaf actress seven points. Even having a partner who is a World Mambo Champion didn’t help. Marlee looked stiff, barely moving her mid-section. Before dancing, she called her friend Henry Winkler who offered her a pre-show pep talk. Find out if she survives to dance again on tomorrow night’s show. Actress Marlee Matlin stars in the new film Sweet Nothing in My Ear along with Jeff Daniels that airs tonight at 9pm on CBS. They play husband and wife who battle over whether to give their son a cochlear implant. The Hallmark Hall of Fame movie was adapted for the screen from a play by Stephen Sachs. Director Joseph Sargent has won four Emmys. For the role, Daniels had to study sign language and many deaf actors had parts in the cast. A former Gallaudet University sports star is trying his hand at pro soccer. Matthew Eby (pronounced EE-bee) plays for the Real Maryland Monarchs as a reserve defender. The Monarchs are on the third rung of the professional ranks and Eby is believed to be the only professional deaf soccer player in the US. He’s been deaf since birth and grew up in Lancaster, Pennsylvania. The Monarchs make their debut by hosting the Western Massachusetts Pioneers later today. Sign language interpreting is one of the jobs most likely to give you a problems with carpal tunnel syndrome and tendonitis. That’s according to a new study by the Rochester Institute of Technology. The research suggests interpreting causes more physical stress than jobs like assembly line work. The study goes even further, suggesting there’s a link between increased ergonomic risk and the mental and cognitive stress of the work. Details are in the journal Ergonomics and more studies are planned. Marlee Matlin survived tonight's competition on ABC's Dancing With The Stars. She was in the bottom three but Priscilla Presley didn't fair so well. The oldest competitor (at 62) was sent home. The second lowest vote-getter was was Chilean actor Cristian De La Fuente. Besides Matlin, other stars still in the hunt include pro football player Jason Taylor, Olympic skater Kristi Yamaguchi, R&B singer Mario, and actors Shannon Elizabeth, Cristian de la Fuente, and Marissa Jaret Winokur. A new hearing aid called the Lyric by InSound Medical falls somewhere between a cochlear implant and a traditional hearing aid. Instead of implanting the device in the inner ear (like an implant), doctors place the Lyric deep inside the ear canal, about a sixth of an inch from the ear drum. The procedure does not require surgery or anesthesia. But it can be removed in just a few moments with the help of a small magnet. The Lyric can remain in the ear 24 hours a day and batteries can last as long as four months. The risk of infection is removed by placing a spongy material around it to allow moisture to escape. Users pay a yearly subscription fee of about $3000 for two devices (for each ear). About 15% of potential users will not be able to use them because of narrow ear canals. But for those who do, doctors say the result is more natural sound than traditional hearing aids because it does not need much amplification. About a dozen clinics are offering them in California, Florida and New Jersey are offering the Lyric now and by the end of the year 100 sites will do so. Johnson & Johnson is a major investor in the Newark, California company. Lanny Steptoe says his arrest on a charge of passing false checks cost him extra time in jail because Houston’s Harris County isn’t equipped properly for the deaf. He wasn’t able to call his family because the jail has old text phones that aren’t compatible with newer video phones. The Sherriff’s office says it’s looking into getting some new equipment. Only Priscilla Presley scored lower than Marlee Matlin on Dancing with the Stars tonight. Matlin and partner Fabian Sanchez scored a 22 after their samba. Marlee impressed the judges - they called her inspiring and a trouper - but she took a few stumbles and that cost her. The ABC reality program showed her and Fabian going to Mexico where kids are being fitted with hearing aids. A new film called Music Within tells the story of Richard Pimentel. Pimentel lost his hearing during the Vietnam War and when he returned home he struggled to finish college and get a job. He eventually became an activist for the rights of the disabled. His efforts helped the Americans with Disabilities Act. Director Steven Sawalich has a personal interest in the Deaf community. He’s the stepson of Bill Austin, who runs Starkey, one of the world's largest manufacturers of customized hearing aids. Thousands of fans and more than 500 players from 48 teams across the country gathered in Orlando this weekend for the USA Deaf Basketball Tournament. The event started in 1945. This year marks the 64th Men's and 18th Women's tournament. Players have to be deaf or hard of hearing but coaches do not. The tourney uses NCAA rules - except referees make calls using both a whistle and his hands. Albert Y. Lin - a partner at Brown McCarroll in Austin, Texas. A deaf youth minister has been arrested for for indecent behavior with a student at the Louisiana School for the Deaf. He's accused of having a inappropriate relationship with a 14-year-old girl. Police say they found sexually explicit messages he had sent to the girl. He's the fifth person arrested on such charges related to the school in the past six months. A WiFi-enabled, portable videophone will be available to the public this week for $99. Viable first unveiled its VPAD a few months ago for $699. To get the discount, you have to be registered for the DeafNation Expo in Pomona, California. But if you are not on the west coast, don't worry. The expo will probably be visiting a city near you before the end of the year. Check the DeafNation website for details. Later on, the VPAD will be available online. Viable is a Rockville, Maryland, deaf-owned company owned. Public-service programs on European Union television stations must now be subtitled. While meeting in Brussels today, the European Parliament decided closed captioning should be mandated as soon as possible. Closed captioning is common in Europe for films and imported programs. At the same time, the BBC has moved to subtitle all its programs. Actress Marlee Matlin has survived to dance in the 4th round of TV’s reality show Dancing with the Stars. Comedian Adam Carolla was eliminated from the ABC dance-off during last night’s results show. Matlin and her partner Fabian Sanchez still face competition from pro football player Jason Taylor, Olympic skater Kristi Yamaguchi, singer Mario, and actors Shannon Elizabeth, Christian de la Fuente, Priscilla Presley. Gallaudet University has its first chair fully endowed by a deaf person. 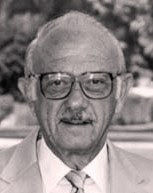 The Gerald “Bummy” Burstein ’50 Endowed Chair in Leadership will now begin appointing scholars to study and research leadership in the deaf community. The $1 million chair was set up nine years ago by Burstein who picked up the nickname because of his support for his hometown team, the Brooklyn Dodgers, also known as “Dem Bums.” The Dodgers eventually moved to California and so did Burstein. He was the first deaf person to receive an honorary Doctor of Laws degree from Gallaudet and is credited with introducing Americans to deaf applause as hands waving in the air. He first saw it in France. Bummy is also an expert parliamentarian with several books to his credit. When someone suffers unexpected hearing loss, close relationship are affected more than anything else. That’s the finding of an online survey by the Harris Corporation. The cochlear implant maker says 54% of more than 2500 adults say they have been frustrated by people who showed no consideration for their hearing loss. A third said they felt really annoyed and 18% said they were ignored. Only a fifth of them were aware of the treatments available. Alexander Veman is getting $175,000 because he wasn't provided a sign language interpreter in his adult classes at Maryland' Morris County School of Technology. The county vocational school in Denville tried to make due with a voice recognition device that didn't work properly and only hired an interpreter after he hired an attorney - and then it wasn't for the full school day. School officials say they had trouble finding an interpreter who could work the needed hours. Morris County School of Technology has agreed to put up signs about the school's responsibility to provide interpreters and add new procedures to ensure every efforts is made to get interpreters. Following protests from unhappy parents and students, the chairman of the board at St. Mary’s School for the Deaf in Buffalo has resigned. At the same time, a recently fired math teacher may come back to the school. Although it receives government money for operation, the board has kept its meetings secret. Although members have not agreed to open their gatherings to the public, they have said they will post summaries on the school's web site. An advisory board made up of parents will also be formed. A group of students taking sign language at a California high school pretended to be deaf for a day to better understand what it is like to face the obstacles that those with hearing loss deal with every day. They only spoke in sign language on March 20th at Valencia High School. Some students put signs around their neck saying "deaf' and others wore earplugs so that others would understand what they were doing. The idea was hatched by sign language teacher Phyllis Madden who led students in playing typical deaf games that require ASL or body language and gestures. Grades for the exercise were lowered if students were caught talking. New Braunfels, Texas has agreed to pay a deaf woman $75,000 for not providing her a sign language interpreter during a 911 emergency. Maria Salinas found boyfriend Ed Spencer unresponsive on her couch and had a neighbor call for call. Even though police knew she was deaf, they made no attempt to locate an interpreter. City officials have also agreed to put a new policy in place related to emergencies dealing with deaf individuals. Deaf Actress Marlee Matlin has made it to the third round of competition on ABC's Dancing with the Stars. During last night's show, Matlin talked about her work as a volunteer narcotics officer. Steve Guttenberg was kicked off. That leaves Matlin to compete with radio host Adam Carolla, pro football player Jason Taylor, Olympic skater Kristi Yamaguchi, R&B singer Mario, and actors Shannon Elizabeth, Cristian de la Fuente, Priscilla Presley and Marissa Jaret Winokur. They'll all return on Monday night to dance the fiery paso doble or the elegant Viennese waltz. You can watch the show online. Jack and Sarah Miller's insurance company won't be paying for their son's cochlear implant. HR Trust Services has been shut down by the Texas Department of Insurance. The state agency says the company never had a proper state license. The Millers say they are looking at more than $70,000 in debt. They are looking for a new insurance company that will cover their toddler's condition and plan to hold a fundraiser to help pay their bills. If you missed seeing deaf actress Marlee Matlin last night on Dancing with the Stars, you can watch her online. She danced the jive and scored 21 points. The judges said she did a "great job" and is an "incredible performer". Talk about Gallaudet University shutting down its football program are not true. The school issued a statement today saying Deaf Digest posted a note in its e-newsletter that started the rumor. It said President Davila would close the program due to financial setbacks. But Deaf Digest has issued an apology, explaining it was supposed to be an April Fool's joke.